The next polish I have for you from Ruby White Tips is The Sword from The Kill Bill Collection. 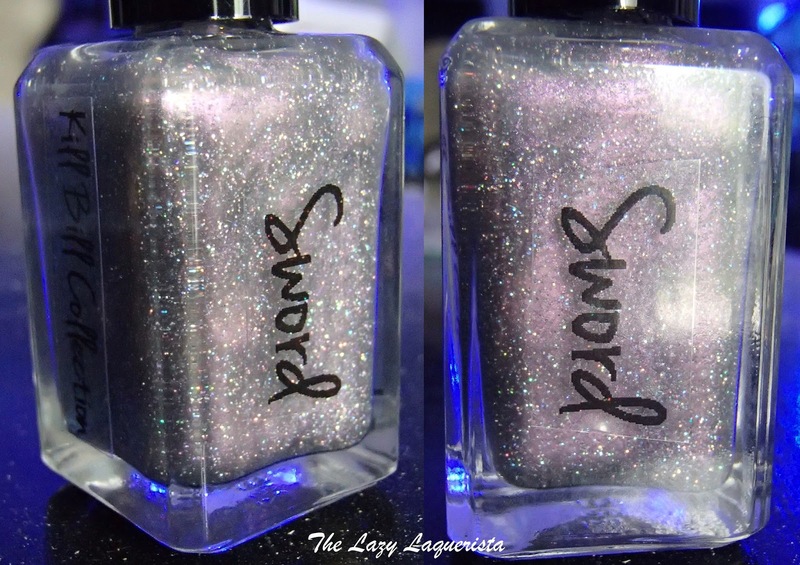 This polish is a pearly colour shifting polish with a silver holographic glitter sprinkled through out. In sunlight it shifts from purple to a light gold. In some indoor light I noticed a slight green tinge to the gold. All of the pictures show three coats of The Sword in natural sunlight. I didn't use a top coat because the polish dried perfectly smooth on its own. The holographic glitter may make it look a little rough in the pictures but I assure you this is an illusion. After three coats you could still see the nail line a bit but only at certain angles. When the light was hitting it directly and the purple colour was more pronounced the polish appeared opaque. The formula on this polish was great and it was a breeze to apply. It ended up being a much better layering polish than I originally expected after first coat. I did try applying CND Super Shiney top coat after taking these pictures and it didn't affect the look of the polish at all. I really like this one. It could also be used as a shimmery top coat over a solid base colour. Ruby White Tips polishes are always 3-free, vegan and are never tested on animals. If you'd like a bottle of The Sword you can check out the Ruby White Tips Etsy shop at https://www.etsy.com/shop/RubyWhiteTips.